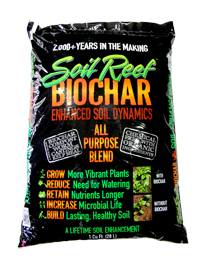 Soil Reef™ Gardeners Blend is an all-in-one biochar blended soil enhancement made with 50% biochar, top grade organic compost, organic worm castings and kelp meal. Our biochar is sustainably produced from wood waste and forest residue and is made in the U.S.A.
At $49.00, including free shipping, our product is an unbeatable $2.00 per pound and a great value for a premium biochar blend. Approximate shipping weight is +/- 25 lbs. A one cubic foot bag of Soil Reef treats up to 24 sq. ft. of garden space. Or mix in your containers, at approximately 10% by volume, with your potting medium. * Shipping is free anywhere in the continental United States! 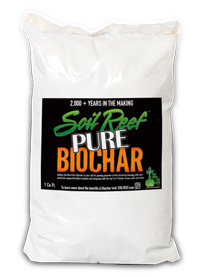 * Receive a free Biochar eBook with your Soil Reef™ Pure Biochar or Gardeners Blend purchase. Sustainable Biochar – provides inorganic carbon, which builds soil and acts as a nearly permanent sponge to absorb nutrients and water, and creates a home for microorganisms. Compost – provides immediate soil food with organic carbon and living soil microbes, building soil tilth and humus. Combined with biochar, the benefits of compost are more pronounced. Worm Castings – provides nutrients, enzymes, and Actinomycetes bacteria, which fix nitrogen and break down tough organic matter into food plants can use.